With the Heating Thermostat you can reach your individual well-being temperature in any room around the clock: Easily regulate the temperature for each room with the touch of a finger on the touchpad and save energy without sacrificing comfort. Do you prefer a low temperature in the bedroom at night, but you want to be welcomed by a heated bathroom after getting up? Then this underfloor heating thermostat is just right for you: The thermostat was developed to individually control the temperature of rooms in smart homes. The modern glass touch thermostats can control different water-based heating and cooling systems - for example: heating cable, heating foil, water valve, electric valve, boiler, fan coils, solar energy controllers, heat pumps, ventilation systems etc. 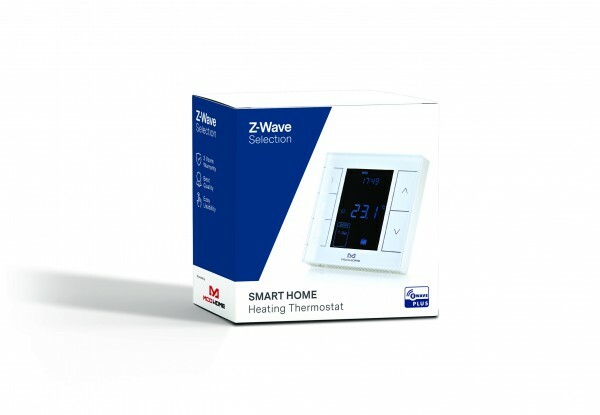 The Heating Thermostat has the functionality via association groups with Z-Wave binary switches. This means that these devices, such as relays or intermediate plugs, can be linked directly to the thermostat. This allows you to operate any on/off heating switch without the need for a static Z-Wave gateway. This thermostat for underfloor heating offers you more comfort with less energy consumption in your own four walls: control your individual well-being temperature per room. Related links to "Heating Thermostat"